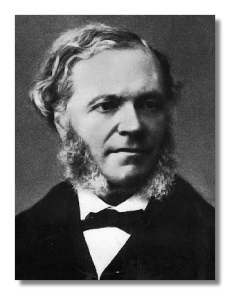 César-Auguste Franck (December 10, 1822 - November 8, 1890) was born in Liège. As early as the 16th century, his ancestors had displayed artistic inclinations, and both César and his brother Joseph showed musical ability at a young age. These were seized upon by their father, who insisted they enter Liège Conservatoire. Still only 11, César emerged from the Conservatoire with honors, ready to embark on a career as an adolescent keyboard virtuoso, together with the older brother who was a fine violinist. After provincial tours, the father moved the entire family to Paris so that both boys could attend the Paris Conservatoire. César progressed rapidly and was ready to attempt the Prix de Rome when his father withdrew him so that he and his brother could go on tour and earn money. By this time, César was composing prolifically (chiefly to provide himself and his brother music to perform) and by the age of 12 had already completed at least two piano concertos. Even at this stage his compositions showed a command of form and technique, hinting at the heights that his mature works would achieve. By 1846 Franck was tiring of the life of a professional pianist, despite his father's attempts to drive him on. Now in his mid-twenties, he was ready to assert his independence. He became engaged to the daughter of a well known actress and the two were married in 1848 during the chaos of the revolution. His family was scandalized by the marriage, but César settled with his wife in Paris, where he earned a living as an organist, choirmaster and private tutor while continuing to compose. It was only after 20 years of such toil that he received in 1872 the appointment as organ professor at the Paris Conservatoire. An entirely unworldly and straightforward man, Franck's lack of cunning and inability to ingratiate himself with those in power were probably responsible for such a long delay in the recognition of his undoubted talents. By 1873 he was busy composing the oratorio Les Beatitudes, the first of his mature works which is still regularly performed today. His teaching career continued uninterrupted and in time he came to be more highly regarded by talented pupils such as Vincent d'Indy, Ernst Chausson and Pierre de Bréville than any other teacher at the Conservatoire; although he was nominally in charge of organ lessons only, his broad interest in music and deep understanding of composition equipped him to impart more information to talented and inquisitive students than their own backward-looking composition professors. Yet Franck gained little or no recognition for the stream of mature compositions now issuing from his pen. A private concert at his home in 1879 was virtually ignored by his peers. During the 1880s he composed his greatest orchestral masterpieces, including the two symphonic poems, Le Chasseur Maudit (1882) and Les Djinns (1884), his famous Symphonic Variations (1885), the Symphony in D minor (1886-88) and Psyché (1887-88), as well as the brilliant Violin Sonata in A Major (1886), but none of this music was performed until another private concert in 1887, which was organized by his students in an effort to publicize their mentor's talents, but the ill-rehearsed concert was a failure. Similarly, when his symphony received a premiere in 1889 from the Société des Concerts du Conservatoire, it was doomed before it was even played: the orchestra had no interest in the music and performed it badly, and the subscribers who supported the Society's events expressed little desire to hear the work again. In 1890 he achieved an unexpected success: the Ysaÿe Quartet performed his String Quartet in D and it receives positive reviews – the first of his long career as a composer. Yet he was to achieve no more, for in the spring of that year he was knocked down by an omnibus in Paris, receiving injuries to his side. After a short period of recuperation he declared himself fit and returned to work. However, his injuries were clearly not repaired and a few months later he developed pleurisy, quickly succumbing in his weakened state. At his death he remained still largely unrecognized, many of his greatest late works unperformed and unknown to all but his closest friends and loyal students. It was a former student of his, Charles Bordes, who wrote a compelling biography of his mentor which did much to turn the tide of public opinion in Franck's favor. The mature works of his last two decades display the kind of melodic shape, harmonic construction and overall atmosphere which can be traced back to his long employment as organist/composer for Saint Clotilde Basilica in Paris. Franck was one of the first composers to aim at creating music which sustains a meditative mood without being histrionic or melodramatic: this is best exemplified by his masterpiece, the Symphonic Variations, in which the listener can virtually hear the composer improvising his variations at a church organ, especially at the crucial shift from major to minor midway through the piece. Such a strong individualist either creates a broad school of imitators and acolytes, or stands apart from the mainstream; Franck's music, though widely admired in the decades after his death, led to no school, as "Debussyism" was to do within ten years of Franck's demise. However, his influence on the succedeing generation of composers was extremely wide: among his pupils were Henri Duparc, Guillaume Lekeu, Guy Ropartz, Paul Dukas, Gabriel Pierné, Alexandre Guilmant and Albéric Magnard. In addition to the works already mentioned, his organ music demands attention, partly for the clue it gives to his overall output, but also for the special nature of the late compositions. Franck's organ music appeared at a time when organ music in France was becalmed and of little interest; his raising of its standards left a legacy built on later by Frenchmen such as Charles-Marie Widor and Olivier Messiaen. His Six Pieces (1862) contained in embryo many of the musical ideas he later developed, while the Three Pieces (1878) and his last completed compositions, Three Organ Chorales (1890), are masterly expositions, the chorales for the most part using the variation form to excellent effect and exude a wonderfully mystic, almost transcendental, air. They are outstanding works which should be placed among his orchestral and chamber pieces in any summary of his best compositions.